← Is this a giant plum? Nope, an Arkansas Black Heirloom Apple from @tinysorganic weekly delivery. Beautiful! Altought I´m happy Eastsider I periodically feel the need to cross 520 bridge to keep warm my urbanite side. Last Monday I decided to meet my friend Mary with the idea of having a quick bite at Etta´s seafood and visiting after the brand new SAM exhibit Peru: kingdoms of the sun and the moon. I know everybody is happy enjoying a sunny day, but I love driving to the Waterfront when is cloudy and foggy because is in these days when you can nearly “touch” the real Seattle spirit. 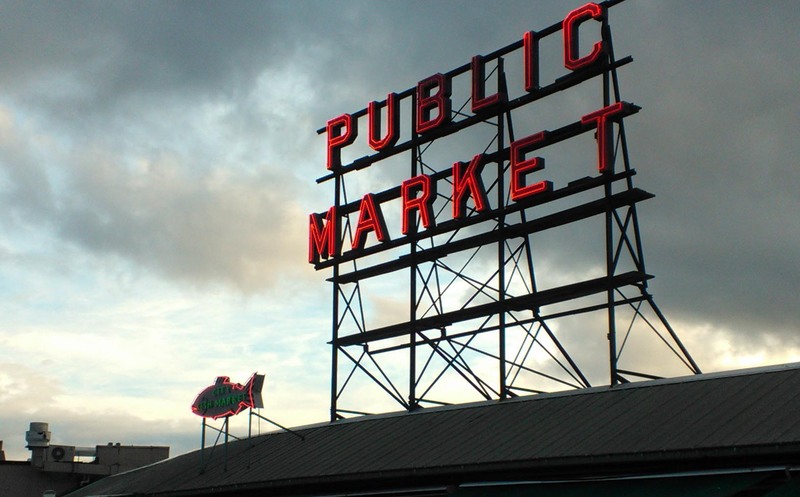 For me Etta´s seafood belongs to this real seattlelite experience nobody has to miss visiting our city. Anyway It was my first visit, so I look dissappointely to the menu looking in vain for the famous Eggs Benedict with Dungeness crab, another authentic Seattle dish. Everything 100% authentic, oh my lord. But I rediscovered a better alternative. The $15 Seattle Week Restaurant*, menu, a real bargain! 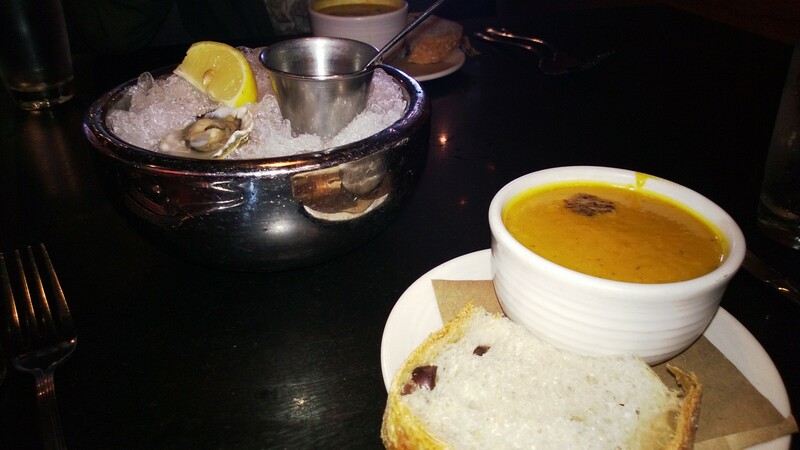 I opted for the squash soup and the salad with pasta, and mushrooms, but I didn´t want to miss the opportunity to taste the local oysters so I chose the Vancouver variety, suggested by the waitress. Eveybody knows that we Spaniards are seafood lovers, so I was transported for a moment to Galicia, but with the local touch of Tabasco and a little fork. In Spain you eat oysters with your hands, only with a touch of lemon. I´m happy to live in a aplace with such an amazing sea creatures. Coming back to the menu, the squash soup was really good. A bit spicy for me, but I have to say my taste is super austere, I love foods with few spices, dressings and sauces. Following the Spanish term, I´m a food purista. 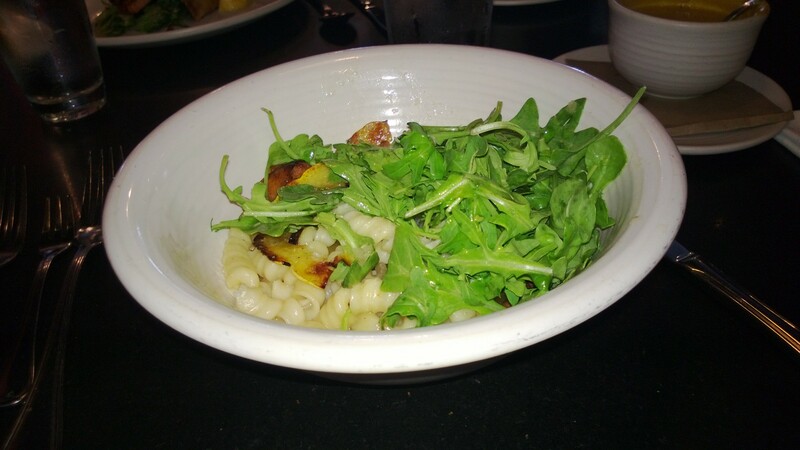 That´s precisely why I enjoyed so much the pasta, arugula and mushrooms salad. It´s been tossed only with olive oil, so the aromatic flavors of green and fungi were sublimated instead of camuflated. By that time I had forgot to check my watch and Mary was giving me all the details about her new fascinating new role as Program Coordinator of Freedom Education Project Puget Sound, that provides college education inside the Washington Correction Center for Women. FEPP offers courses in English, Math and Spanish to more than 60 students. In addition to these classes, FEPPS sponsors a monthly lecture series. I´ve always believed that everybody deserves a second chance to give a meaning to his life, so I find this project and its mission really fascinating. When the dessert came, panacotta for both of us, we decided to loose our maybe too ambitious schedule and to go back to the SAM exhibition in a few weeks. Sometimes is better to enjoy pleasures bite by bite. “But next time we´ll visit first the exhibition, OK?,” I said. “Done,” answered Mary with a big smile. Posted on October 24, 2013, in Eateries, Eateries and restaurants and tagged Dungeness crab, Etta´s seafood, FEPP, Freedom Education Project Puget Sound, Galicia, Mary, Monday, oysters, SAM, Seattle, squash soup, Tabasco, Tom Douglas, Vancouver. Bookmark the permalink. Leave a comment.